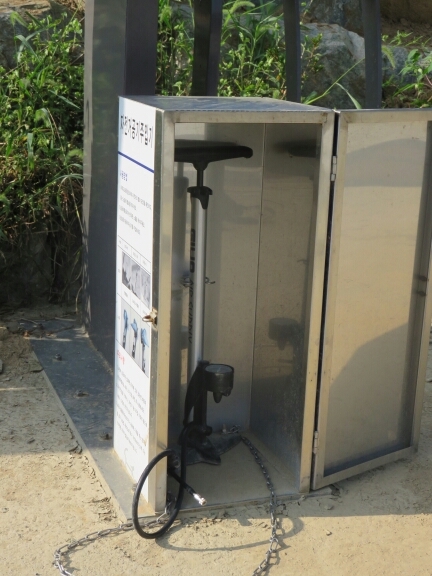 As long as you kept to the cycle paths in Seoul riding there was a dream as the routes they had through the city were well thought out and well maintained in general. 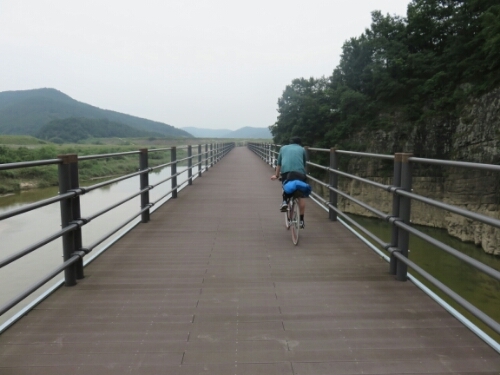 Luckily the friend I was staying with lived very close to a canal with a cycle path running by it that intersected with the main cross country route through South Korea. Technically once I was on this route I should be able to ride from Seoul the whole way though Korea to Busan in the south without once leaving the path. At this point after riding through Central Asia and China any kind of cycle path was a luxury and a cross country one was a joy that could be barely imagined. I was thus quite excited and worried about being disappointed. Thankfully, initially, the cycle path was far better than I had even thought possible. The surface was perfect and the route was initially just for cyclists with a pedestrian walkway alongside some of the time as well. 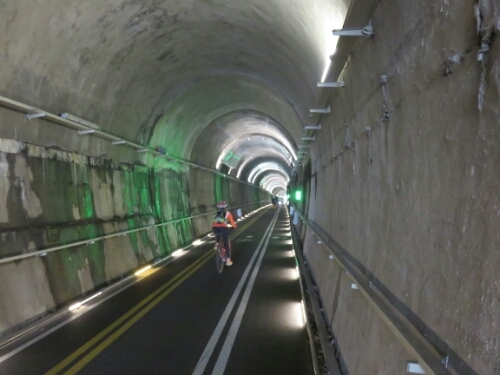 The work that had gone into it was incredible and old infrastructure had been converted for use by cyclists. For instance for a while it ran along the route of an old train track and even went through old train tunnels. 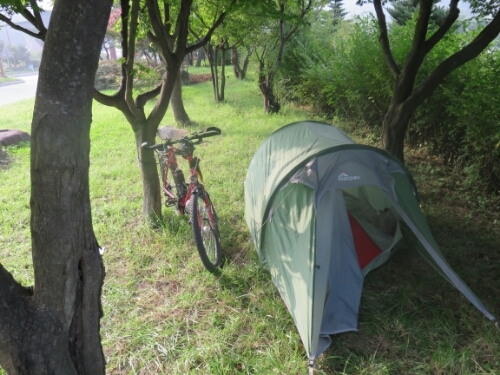 It was also very well used and as I was leaving on a Korean pubic holiday there were hundreds of cyclists using the route. Koreans seemed to take cycling very seriously with most people seeming to have more kit than a professional, making me feel decidedly underdressed. 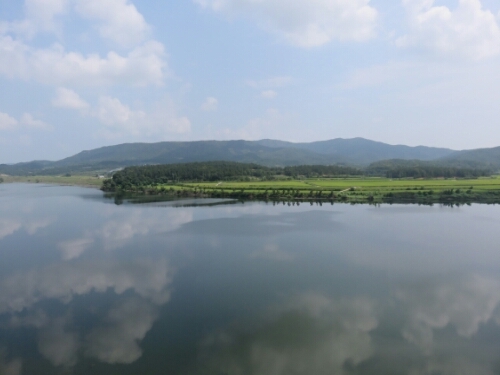 The cycle route I was taking was called the ‘Korea’s 4 Rivers Cross Country Cycling Road Tour’ and it runs from near Incheon all the way down through the country to Busan; the majority of the time it is alongside some of Korea’s many different rivers, hence the name. 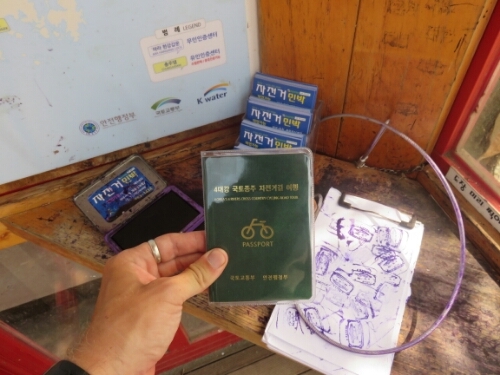 As part of the tour it is possible to buy a passport and get stamps at various booths on the route to prove you’ve done it. I thought it’d make a nice souvenir. I wasn’t convinced how motivated I would be to get all the stamps though. It wasn’t long after I left Seoul that I noticed another cyclist come alongside me who I thought might speak English as well; the huge hipster beard was a dead giveaway. As he drew up I thought I’d better check I was going in the right direction as there was more than one cycle path at the moment and I was still getting used to following them rather than roads again. 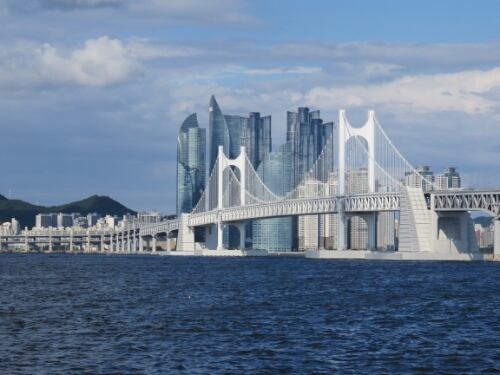 It turned out that it was the way to Busan and that the beard belonged to Bart. Bart, an Australian, was also heading to Busan by bicycle and we kind of ended up riding together – at the outset I think because it would almost have been rude not to. 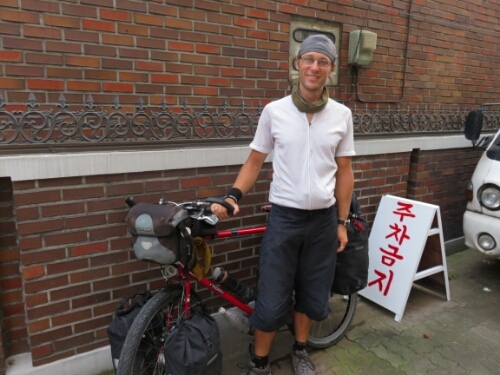 Bart was bravely attempting to cross a country on a bike he had bought in Seoul that was perhaps better suited to cruising around a city trying to look cool on. It was at least cheap and not a fixie – the gears would come in useful for the mountains later. Bart was also travelling very light with a one man bivy tent to sleep in, a light sleeping bag and a few clothes. This meant I spent most of the time with my legs pumping trying to keep up with him, hoping that as it was his first cycle tour he’d tire eventually, I’m not sure he did. The cycle path seemed to have been built as part of a massive river regeneration project – at intervals along the route on the first day there were huge weirs that the path crossed over to move you from bank to bank. I think it was possible to ride whichever side you wished a lot of the time but as we couldn’t understand the Korean signs we just went the most obvious way. 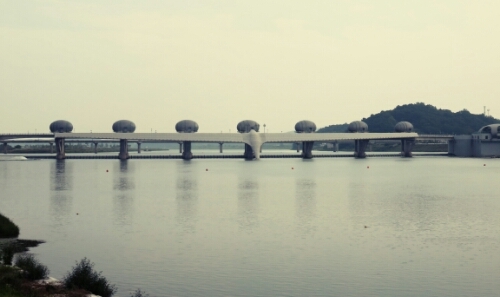 This weir was designed to look like a huge aeroplane. A lot of attention had clearly gone into making the functional infrastructure look modern and interesting and for the most part it worked. The first day was extremely pleasant and pretty easy being mostly flat and on perfect surface. Bart and I literally rocketed along. I felt like a Chinese truck thundering along the path shooting past a lot of the Korean riders out for more sedate weekend rides. I felt ridiculously over equipped for the ride, my first aid kit and even bicycle pump were redundant as there were communal ones located at intervals along the road. I consoled myself with the knowledge that it hadn’t and wouldn’t always be like this! The only problem so far with Korea had been the cost. Whilst not being wildly expensive, after China and Central Asia it was a bit of a shock to the system. This meant I was a little nervous about being able to find somewhere cheap to sleep. I needn’t have worried. 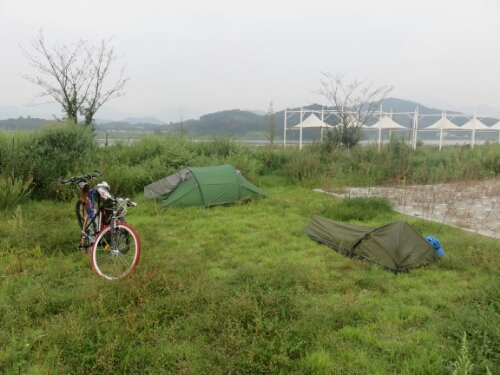 The cycle route is a dream for camping and from the sounds of it most of the country is the same. Basically if there was a bit of grass it seemed to be acceptable to camp on it and there were a lot of parks lining the route. The first evening Bart and I came upon what seemed to be a free ad hoc campsite right by the river and after checking with a group of English teachers that it was actually free and we could actually set up anywhere we did. 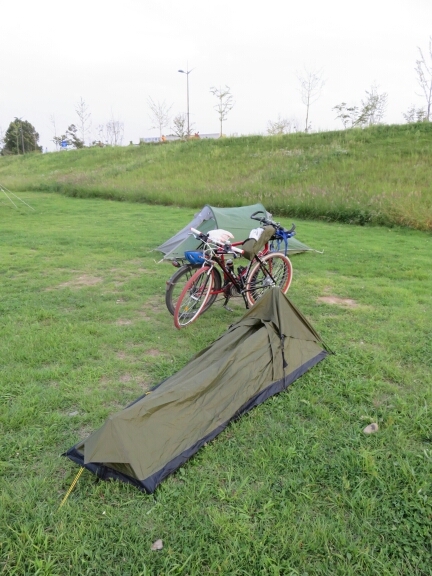 There were a lot of Koreans camping there already and they seemed to take a similar attitude to camping as to cycling: buy all the kit on sale and work out whether you actually need it later. After setting up we took up the offer of the English teachers to come back and say hello. They were variously from the US, Canada the UK and had been teaching English in Korea for different lengths of time. They were very kind and introduced Bart and I to a couple of new Korean drinks and even let us set off some fireworks with them. This was quite exciting for me as I had managed to reach 31 without ever having lit a proper firework myself that I could remember. 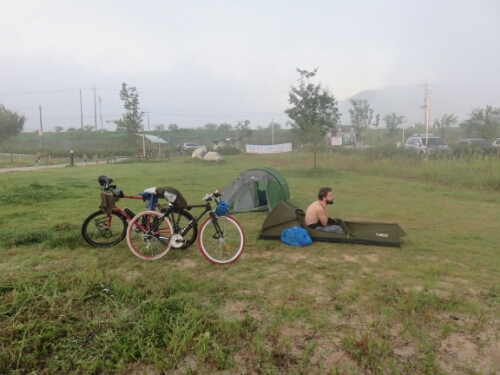 The next morning we woke up to discover a slight issue with camping by the river in September: the morning mist. This had coated our tents and bicycles with a heavy layer of condensation. My tent was absolutely soaking – luckily only on the outside. As neither of us were in a hurry we decided to go back to sleep and wait for the sun to dry them out a bit. Luckily this worked and we were able to set off with dry kit. The second day started out much like the first with nice easy relatively flat riding alongside the river and we continued to make good time. The scenery was beautiful if not spectacular with pretty green hills and lush vegetation the norm. After lunch we were briefly joined by a Korean cyclist who nervously asked if he could join our group. Sadly he didn’t stay long as he rode off on a side trip in order to get a stamp for his passport not on the main route after about 10kms. Neither Bart nor I were particularly interested so we bid him farewell expecting him to catch us up on his much sportier road bike. We never saw him again. That evening the route was to catch us out slightly. We’d both expected it to continue on nice and flat along the river but come the afternoon we found ourselves struggling up a series of fairly steep climbs. The scenery was beautiful but the gradient was tough. What is more there was no where to camp as it was sheer drops or thick vegetation by the side of the road as we were going through mountains. By the time we reached the peak at 569m it was already almost dark, so we were going to have to make at least part of the descent in the dark. 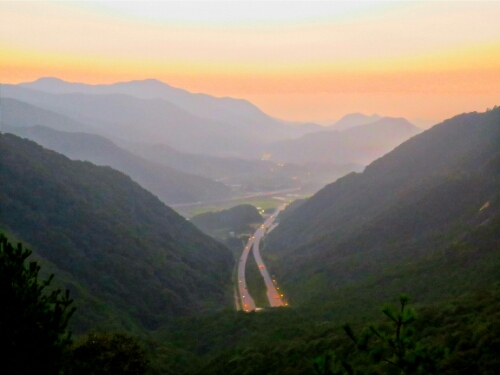 The mountain road was shared with cars which was lucky in some ways as it meant it was wider than it would have otherwise have been if it was just for bikes. We were also lucky in that it was not busy at all so we didn’t have to contend with traffic; just high speed bends with little light. After whizzing down for a while we made it to a town and after looking around for a bit we found some grass under some trees by the side of the road. Normally this would have been a complete no no for me wild camping, as it was fairly visible, by the side of the road and in a town. In Korea though I felt fairly confident we wouldn’t be bothered and this was true and the pitch turned out to be one of the best ones of the trip as the road wasn’t too busy and the trees provided shelter. Before we’d set up camp we’d received some warming kindness from some locals. A restaurant owner had let us fill our water bottles from his cooler and the owner of an apple shop had gifted us both with two huge shiny red apples. These apples were massive and some of the tastiest I’d had. The next day we were out of the mountains and back riding on the relative flat. I say relative flat as while the path has been built for cyclists it hasn’t been built with fully loaded touring riders in mind; this means that there are some incredibly sharp ramps when the path goes up on bridges or changes direction. I was OK with most of them but sometimes I’d end up halfway before realising I’d picked the wrong gear and have to push the last few metres up. Reassuringly this seemed to be happening to a lot of unloaded bikes as well! There was one section which was pretty much impossible to ride up loaded or unloaded irrespective of gearing and both Bart and I had to labour pushing our bikes up it. We think there was a sign suggesting an alternative route that we couldn’t understand earlier. We were now riding through slightly more rural areas for longer and there were less open shops and restaurants along the route. So when we saw one around lunchtime with some other bikes outside we eagerly went inside to get some food. Our enthusiasm had gotten ahead of us though as this wasn’t a restaurant where you just picked a dish off the menu. It was a type of Korean BBQ and we had no idea how to order – in the end we just pointed at the cheapest thing on the limited price list on the wall and hoped for the best. While I felt like a child for much of the meal it did mean that I enjoyed it much more than I would have otherwise if I’d been left to my own devices. While riding we would often see the same groups of guys doing the same ride as us as we would overtake and be overtaken depending on when we stopped for lunch or the evening. Everyone on the route was very friendly and helpful when we needed it. That night we pitched up again as it started to get dark on a convenient piece of grass. Again we were very close to a through fare and again we were totally unbothered. We set off early the next morning with very wet tents we were planning on drying later once the sun had broken through. This fourth day’s riding would be tough in parts again. It included one of the hardest hills I’ve ridden on the whole trip, which while it wasn’t the longest was definitely one of the steepest of any length. By the end I was dripping with sweat and gasping for air. At the end I had I was definitely feeling fairly pleased with myself as most of the other guys who weren’t carrying much weight didn’t make it up without pushing. It was definitely one of the toughest days riding as there was another really steep hill after this one and Bart and I had already been setting a very tough pace. There are hundreds of sections of the route that have been purpose built for cyclists. That night we rode till it was getting dark again as we had wanted to find somewhere to eat and we were in a slightly rural area. Luckily we came upon a restaurant just before night fell and even more luckily there were a couple of guys staying in the attached guesthouse we had met on the road. Thankfully one was Korean so we were able to order some food properly and ended up with a good meal. The only issue was that it was pitch dark when we came out of the restaurant and we hadn’t found anywhere to camp yet. We need not have worried because as soon as we reached the cycle path we found a free campsite to pitch up at that had enough light from the car park and toilet block filtering out for us to put our tents up fairly easily. As night had fallen we had been worried about going to bed with only some instant noodles I was carrying for dinner and had no idea where we would be sleeping. 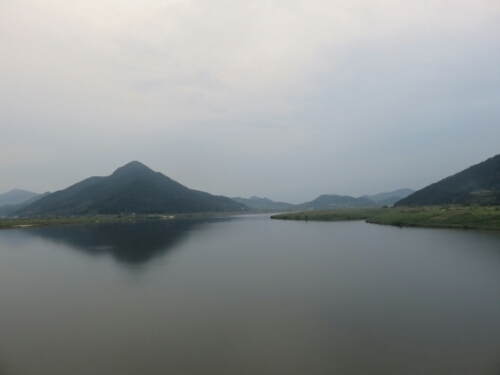 Thankfully Korea had come through again and we ended up with full bellies and a spot to camp with toilet facilities and running water. 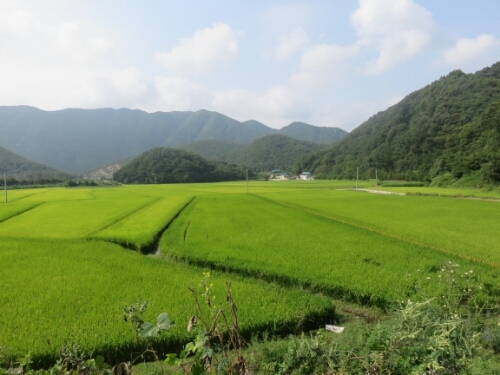 The next day, which was to be our final one riding in Korea, was lovely and sunny and the route very pretty as we rode into Busan. The path was much busier as well, because it was a Saturday or because we were nearing a city or both. In the end we decided to ride to the very end of the cycle path in Busan where I could get the last of my stamps. Here we met some more of the guys we had seen along the way. 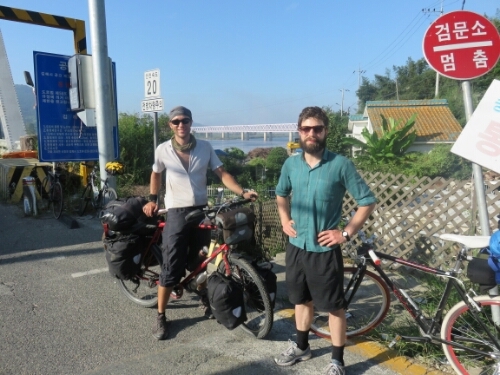 Having finished the cycle route we now needed to find somewhere to stay and so we began what was the hardest part of the trip…Riding off the cycle paths through Busan. It was not easy at all finding our way through the city as it has a lot of mountains that you can’t cycle through and no integrated cycle path system across the whole place that we could see. We were far more tired after an afternoon riding in the city than after days riding across the country! There was some spectacular architecture though including the first double level bridge I had seen. In the end we got where we had planned and managed to book ferry tickets to Japan on the way as well – soon it would be time for riding in another country. 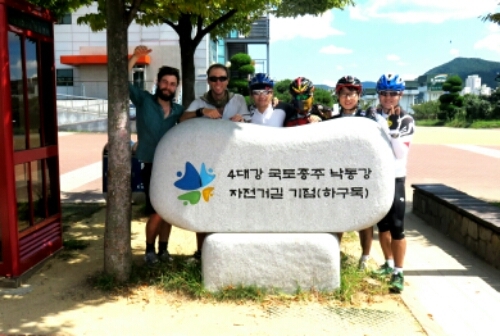 Apparently, It looks S.Korea has the nicest cycle pathway ;D. Congrats again!